Mormons holds a naming and blessing rite for newborns. 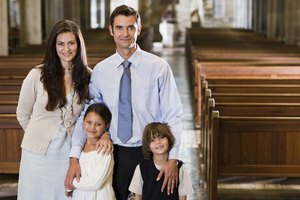 The Mormon Doctrine and Covenants states, "Every member of the church of Christ having children is to bring them unto the elders before the church, who are to lay their hands upon them in the name of Jesus Christ and bless them in his name" (The Doctrine and Covenant 20:70). 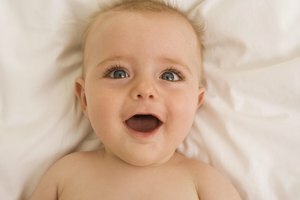 Although Mormon children are not baptized until they are eights years of age (Mormons view this as the age of accountability), all babies are blessed by the church shortly after their birth. Only members of the Melchizedek Priesthood, the higher of the two Mormons priesthoods, may perform the blessing rite for the newborn; the member who leads the ceremony is usually the child's father. The priesthood must also receive permission of the presiding authority (often either the church's bishop or ward president) to conduct the blessing. 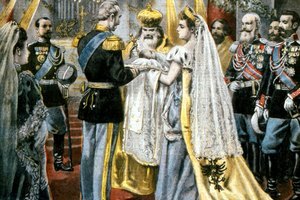 This also means that only men, as the Melchizedek Priesthood excludes women, may take part in the official blessing ceremony. 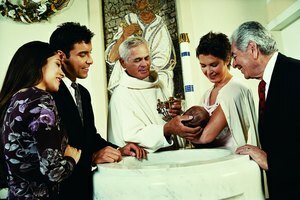 The blessing rite does not only welcome newborns, it also acts as an official naming rite for the child, which in turn makes her an official member of the church. Before the blessing and naming rite takes place, the ward's clerk prepares what is referred to as the "child blessing record" and a blessing certificate, which is signed by the church's bishop and is given to the newborn's parents. During the blessing and naming ceremony, the brethren of the Melchizedek Priesthood surround the baby in a circle and lay their hands under the baby. When performing the blessing, they place their hands onto the child's head. The member leading the ceremony will first address God, state that the blessing is being given by the Melchizedek Priesthood, name the child, give a priesthood blessing and close the ceremony with the name of Jesus Christ. The blessing rite of a child is usually given during the monthly period of fasting,called Fast Sunday. For Mormons, on a given Sunday once a month, the observance of fasting includes going without food or a drink for two successive meals and attending the "fast and testimony meeting," which is when the blessing of a newborn takes place. Cristiano, Jason. "Birth Rites of Followers of the Mormon Religion ." Synonym, https://classroom.synonym.com/birth-rites-of-followers-of-the-mormon-religion-12086764.html. 29 September 2017.